Expedition 53 Commander Randy Bresnik and Flight Engineer Joe Acaba spent six hours and 49 minutes working outside the complex, replacing a partially failed camera on one of the robot arm’s grappling hands, changing a fuse on the Dextre robot, installing a high-definition video camera and preparing various external spares for future robotic operations should they be needed in case of failures. 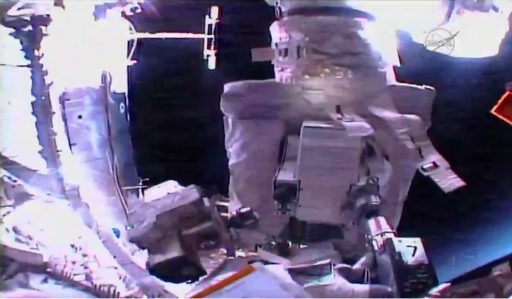 Like the two previous EVAs this month, Friday’s excursion saw all its primary task list items completed by the spacewalkers as well as a number of bonus tasks – despite minor problems related to safety equipment that held the spacewalkers up at two points during the excursion. Friday’s spacewalk was the 205th in support of Space Station Assembly and Maintenance, now totaling 1,278 hours of external work. 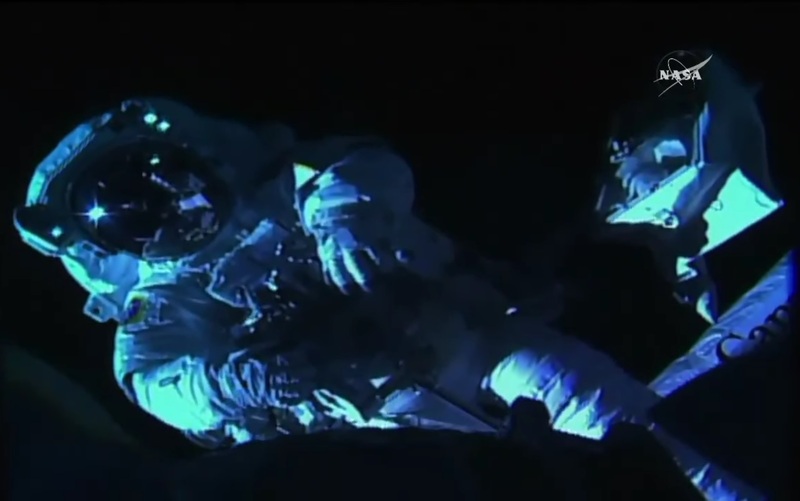 It was the tenth and final planned spacewalk of 2017 – nine have been U.S. EVAs and one was conducted by Russian Cosmonauts for a total of 60 hours and 51 minutes spent spacewalking this year. 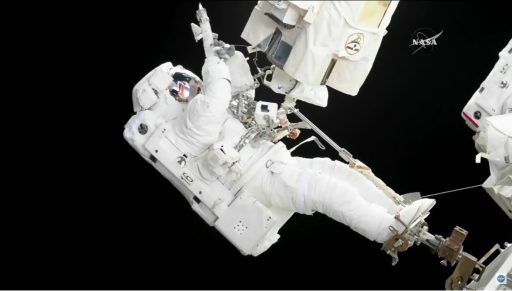 Randy Bresnik now has five EVAs under his belt for a total of 32 hours; for Joe Acaba, it was his third career EVA and he now has a total of 19 hours and 46 minutes spent working in space. 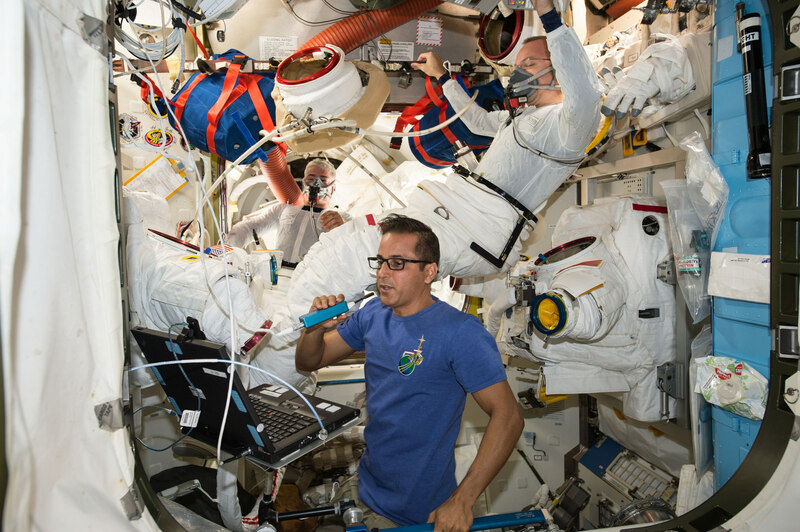 This year has been a busy one for USOS spacewalkers, kicking off in January with a pair of EVAs to finalize the installation of new Li-Ion batteries of the starboard truss of ISS that had been put in place robotically. 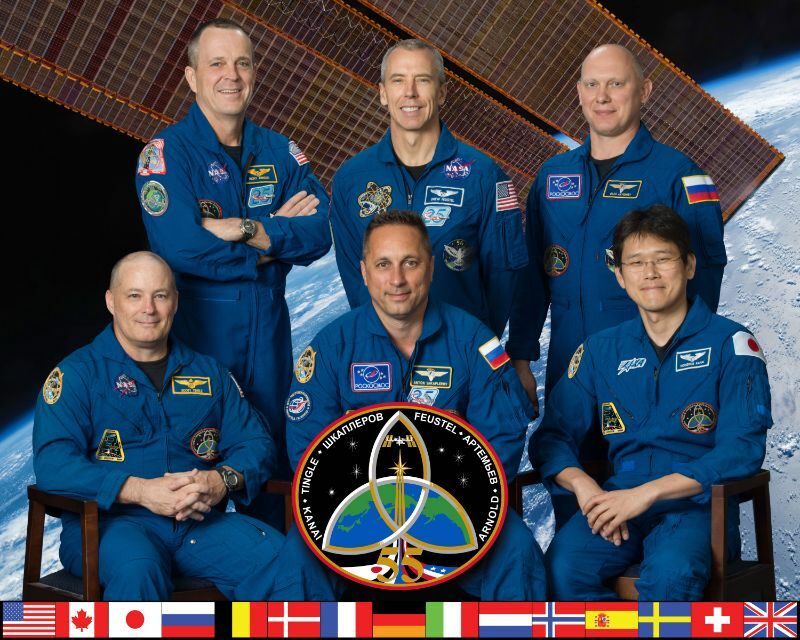 Next were two planned EVAs in March to deal with the relocation of Pressurized Mating Adapter 3 and replace a pair of external computer boxes with upgraded units needed for Commercial Crew Vehicle Communications. In May, a scheduled EVA accomplished the replacement of a payload controller on one of the Station’s Express Logistics Carriers. 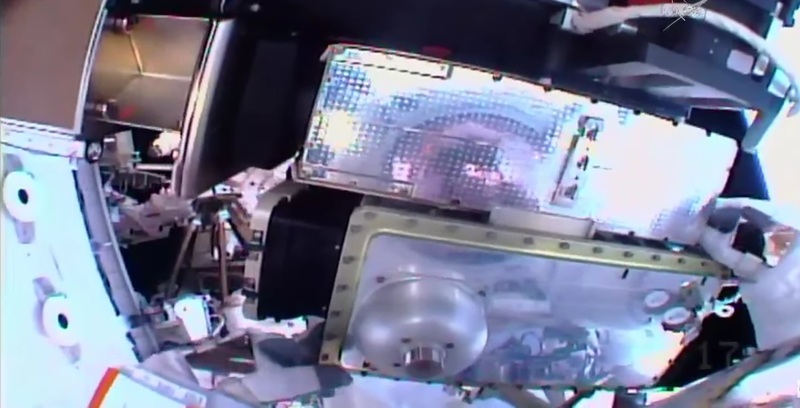 Also in May, one of the two MDM boxes installed on the March EVAs failed, necessitating an unplanned spacewalk to replace it with a functioning unit. Friday’s was the third outing in just 15 days, coming after successful EVAs on October 5 and 10 by Randy Bresnik and Mark Vande Hei. The three October spacewalks primarily revolved around the replacement of one of two Latching End Effectors (LEEs) on the 18-meter long Canadarm2 which had failed back in August when its latches encountered a motor stall. The replacement of the LEE-A was successfully accomplished on October 5 and the second EVA saw Vande Hei lubricate the newly installed LEE to ensure its moving parts can operate smoothly for years to come. The two EVAs by Bresnik and Vande Hei also accomplished the replacement of a failed camera group on the Port Truss and the preparation of numerous external spare parts for future robotic and spacewalk efforts should they be needed in case of equipment failures. The third in the series of EVAs was originally planned to put in place an external HD camera on the Starboard Truss, continue lubrication of the arm, replace a faulty camera group on the Destiny lab, and prepare external spares for future robotic handling. 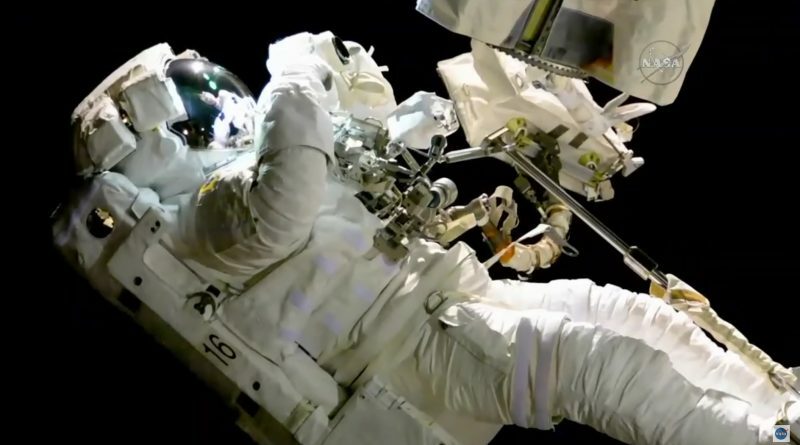 However, the plan for the spacewalk had to be changed when the camera on the newly installed LEE-A was found to be out of focus – a potential problem for future robotic operations such as visiting vehicle captures and external maintenance. Therefore, the replacement of the LEE-A Camera & Light Assembly (CLA) was made the priority of EVA-3 in favor over the Destiny camera. The current LEE-A (S/N 203) started its tenure on ISS 15 years ago when being delivered as part of the Mobile Base System where it acted as the LEE of the Payload/Orbital Replacement Unit Accommodations, a temporary holding platform for large, powered payloads that essentially gives Canadarm2 a third hand to stow items when going through a base change or other operations. As part of its POA career, the LEE was only operated 14 times – compared to over 400 cycles on the former LEE-A (S/N 202). 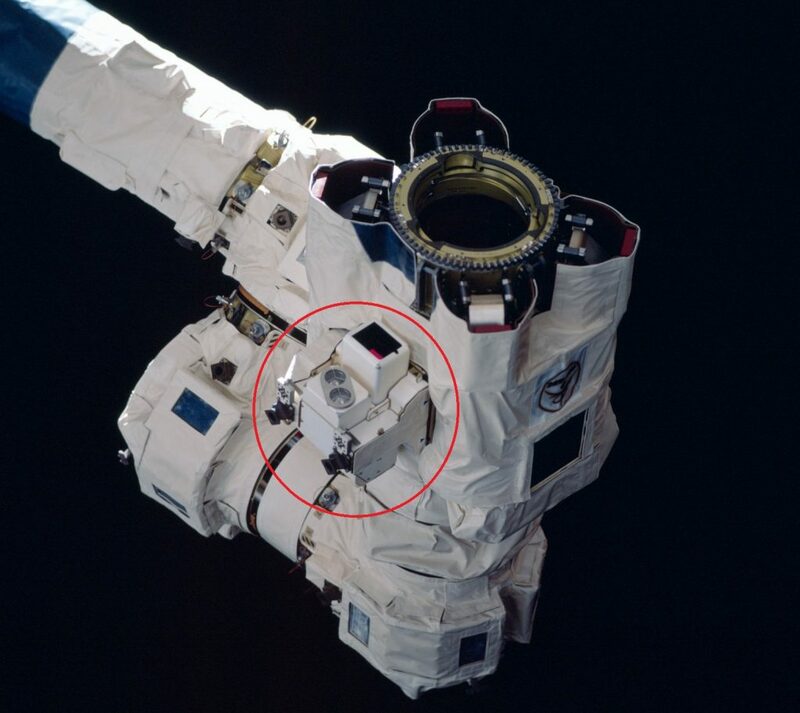 Therefore, the LEE was considered an excellent spare from a mechanical standpoint, though 15 years in the challenging space environment likely caused the degradation observed on its camera and necessitated its replacement. Bresnik and Acaba enjoyed a very smooth EVA preparation process on Friday with the official start of the spacewalk marked at 11:47 UTC when the two crew members switched their suits to battery power and climbed out of the airlock. With the completion of the usual checks of suits and tethers, the spacewalkers pressed into a somewhat light task list for a six-hour EVA, hoping to move through their objectives with time to spare to deal with some additional get-ahead tasks. 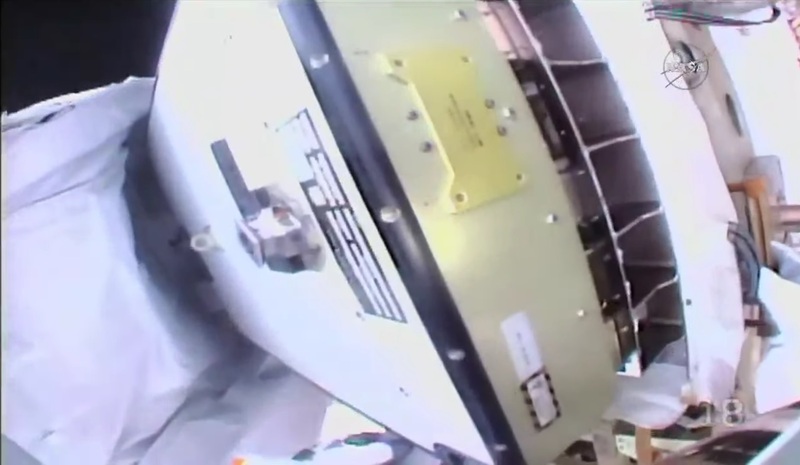 Randy Bresnik started his EVA with a quick task over at the Dextre Robot where he switched out a broken fuse on the Enhanced Orbital Replacement Unit Temporary Platform (EOTP) that provides a redundant power supply to the payload held on the EOTP. 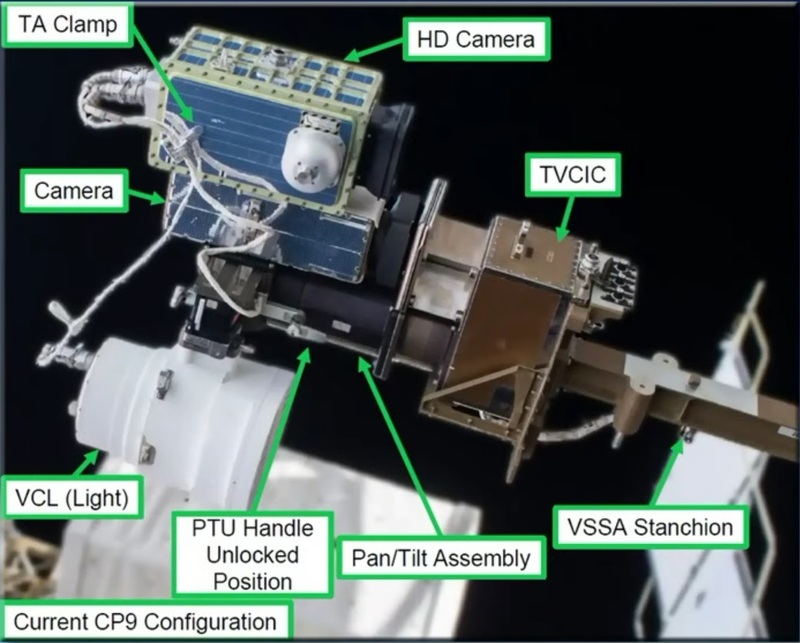 After replacement of the fuse, Mission Control powered up the Dextre robot and Bresnik visually confirmed the fuse was operating, restoring redundancy to the payload power supply. 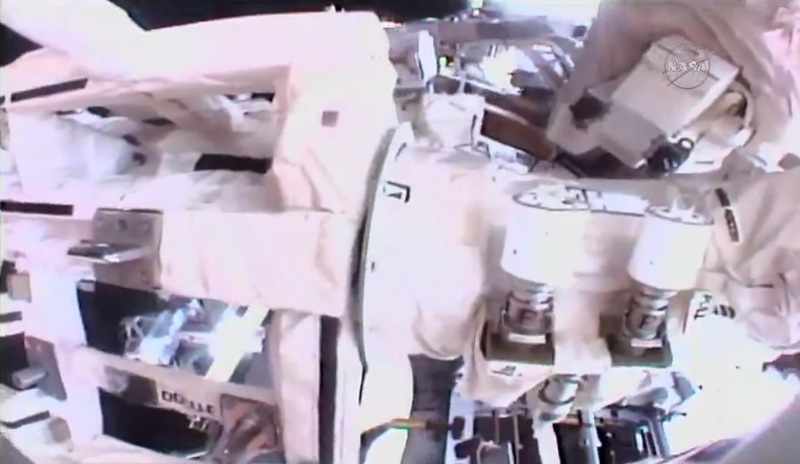 Joe Acaba, venturing into the void for the first time in eight and a half years, started his EVA by fetching an Articulating Portable Foot Restraint and installing it on LEE-A of Canadarm2 to take a ride over to a camera on the lower face of the S1 truss segment. Just before Acaba ingressed the arm, Mission Controllers noticed that one of his safety tethers did not quite look right and closer inspection revealed loose stitching. 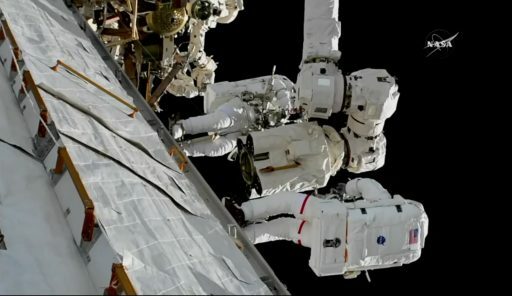 Per the established procedure, Acaba was told to remain in place while Bresnik retrieved a spare from the airlock and connected it to Acaba before moving on with the EVA timeline. 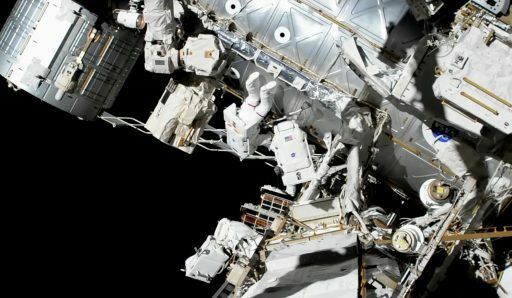 The two spacewalkers made up time by working together to position Acaba on the arm before Bresnik departed for External Stowage Platform 2 and robotic operators Paolo Nespoli and Mark Vande Hei began maneuvering EV-2 toward Camera Port 3 for the installation of an External HD Camera Assembly (EHDCA). These external HD cameras have been developed as add-ons to the existing standard definition camera architecture outside the Station to finally move ISS into the current century where HD cameras have become commonplace, on Earth and in Space. 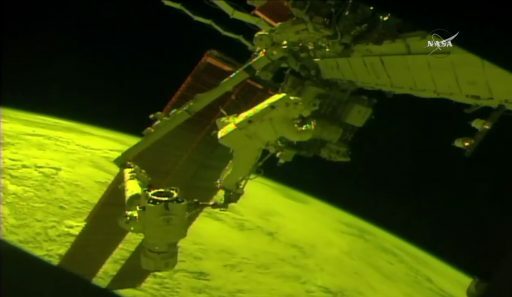 To avoid tapping into the existing system, the EHDCA was designed to draw 120V power from the camera lighting circuit and transmit its imagery wirelessly to the interior of ISS. Each EHDCA houses a commercial Nikon D4 DSLR in a pressurized, thermally controlled housing with an electric motor responsible for setting the zoom level on a 28-300 lens which will allow for close-up inspections of external components. The cameras can be operated to deliver 720p, 60fps video or 16.2-megapixel still images (ISO 100-12800), making them an extremely useful tool for external inspections carried out remotely from the ground as well as Earth imaging without the need for crew time. Each 12.8-Kilogram EHDCA comprises a pressurized enclosure, holding the commercial off the shelf camera, the lens assembly, a power supply, heaters and a data system consisting of an h.264 video encoder, an Ethernet switch and a pair of wireless radio antennas. The installation of the EHDCA required Acaba to first unplug the camera light power supply, slide the camera assembly into a bracket on the standard definition camera and connect the former light power supply to the EHDCA while patching a second connector from the HD camera to the light. These steps went without issue, but after powering up Camera Port 3 after the installation, Mission Control noted an unusually high current draw from the camera light – prompting some troubleshooting steps from the ground. While Joe Acaba was on the arm, Randy Bresnik moved over to External Stowage Platform 2 where he removed a Multilayer Insulation blanket from a spare Main Bus Switching Unit and tied down insulation tabs around its base to make the spare accessible to the Dextre robot. The removal of MLI from various external spares is the result of Canadarm2 and Dextre demonstrating their ability to handle most standard ORU replacements by themselves without a spacewalking crew, provided the replacement units are not covered by MLI which the robots are not equipped to handle. Bresnik also tied down insulation around a Direct Current Switching Unit before pressing into get-ahead tasks which continued the overall effort of readying external spares for future installation. 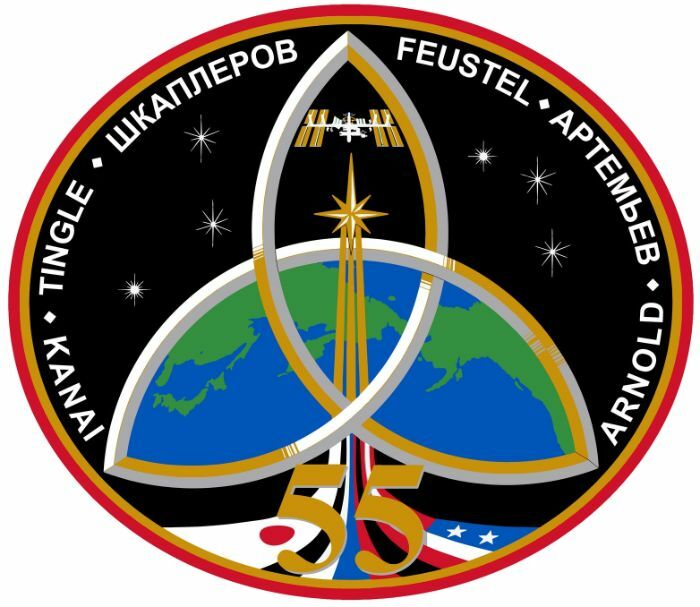 Venturing out port to Express Logistics Carrier 1, Bresnik got to work on a spare Ammonia Pump Module – removing unneeded MLI blankets as well as Velcro straps and tape used as launch locks on the fluid and electrical lines on the pump. He then went on to break torque on the four bolts holding the PM in place and re-torqueing them at a lower value to eliminate any surprises if/when the unit will be removed during a potential repair EVA in the future. As a second get-ahead task, Randy Bresnik installed a pair of T-Handles on the Port Radiator Grapple Bar to allow for future handling of ISS radiators should their replacement be required. These grapple bars were delivered as the first pieces of external hardware riding on a SpaceX Dragon spacecraft, back on the CRS-2 mission, and would be used to help the ISS robots and crew handle the large radiator elements should they need replacement. Egressing the robotic arm, Acaba switched the foot restraint over to the S1 truss and guided the robotic arm into a position from where he could access the degraded Camera & Light Assembly on LEE-A. He made easy work removing the CLA by releasing Velcro covers and a pair of bolts – one for the electrical/data connectors between the CLA and LEE, and the other for the mechanical interface. With the degraded CLA removed, Acaba put the spare unit into a magnetic soft dock before driving the mechanical and electrical bolts to fully secure the spare followed by tying down the thermal covers and providing a GO for the arm to be re-powered to allow the new CLA to be checked out. Mission Control was able to report a good CLA to the crew, giving Canadarm2 sharp vision for future operations including the upcoming Cygnus spacecraft capture set for November 13. Moving into his get-ahead task list, Joe Acaba went back into the foot restraint, armed with a grease gun to finish the LEE-A lubrication task started on the Oct. 10 EVA by Mark Vande Hei who managed to lubricate the central rigidizing ballscrew within the LEE as well as the four latch ball screws, leaving only the linear bearing tracks to be greased. These parts are directly accessible with the grease gun and Acaba deposited vacuum grease to the inside and outside of the eight linear bearing tracks to make sure the LEE’s latches move smoothly over several years of operation. 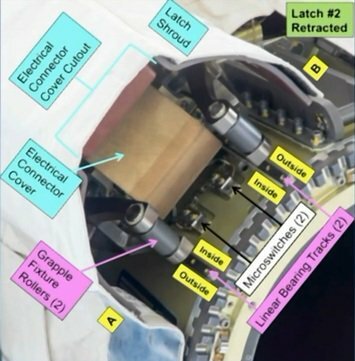 Just as Acaba was dealing with the final of the four LEE latches, Mission Controllers noted that the controller of his SAFER unit (Simplified Aid for EVA Rescue) had popped out of its slot on the #16 SAFER. Randy Bresnik – on his way to the Starboard Radiator Grapple Bar at the time – stopped at Acaba’s location and reported the controller had inadvertently been turned on and indicated a nitrogen quantity of zero, suggesting the SAFER had depleted its 1.4kg nitrogen load due to unintentional contact of the controller with hardware. Acaba was allowed to finish work at Canadarm2 since he was securely tethered to the foot restraint with his waist tether and also had a good safety tether to the airlock. Making his way back to the airlock, Acaba picked up tool bags and was mindful of his tether protocol before securing himself to the airlock D-ring. Per the changed situation, Randy Bresnik was instructed to forego the T-handle installation on the starboard side and instead move to External Stowage Platform 2, closer to the airlock, where he prepared another Pump Module by cutting MLI flaps and removing Velcro – the breaking of torque had to be deferred to a future EVA due to time running out on Friday. Having checked off their primary tasks plus three get-aheads, the spacewalkers began closing out the EVA in methodical fashion with Randy Bresnik making a tool inventory and reconfiguring safety tethers before calling it a day and venturing back into the Quest airlock to mark the end point of the excursion at 18:36 UTC when repressurization was initiated. 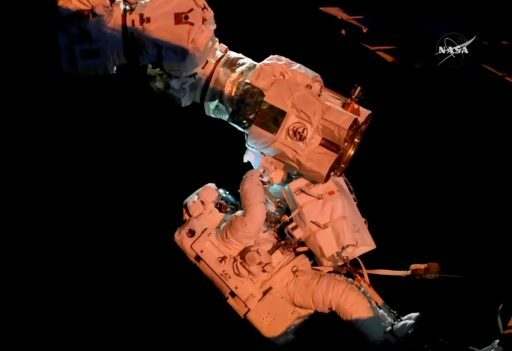 Friday’s EVA closed out the planned ISS spacewalks for 2017, but the suits and airlock will be kept in the standard state of readiness since unplanned spacewalks are always in the cards. 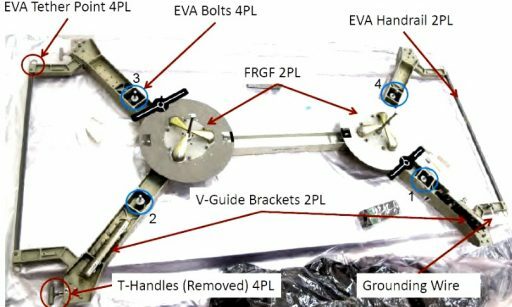 The next planned spacewalk activity will be another three-EVA series in January to deal with the replacement of Latching End Effector B that has also shown degradation over the past year or two. In January, there is also a planned Russian EVA on the schedule, to be performed by Aleksandr Misurkin and Anton Shkaplerov.